The story of Europe and the Near East has an external and internal reality. The external is that history which is “written by the victors”. Like all things completed by man alone it becomes a dead history, a history that cannot change or one that has little influence despite a continuing pledge to “learn from history”. One can say that external history is both official and increasingly scientific, in that science can take ever greater factual leaps into the past, but is what we find there politically acceptable? Do we want the inner history? One of the mysteries of the Mediterranean surrounds the decline of the Minoan culture, the reign of Akhenaton, perhaps the first monotheist, and the exodus of the Jews from Egypt. It now seems quite likely that all of these are connected to the massive volcanic eruption of Thera, also called Santorini, around 1600 BC, which itself has often been equated to the force that destroyed Atlantis. Plato is the sole source of information on Atlantis: that it was a legendary island of high culture destroyed by fire and water, probably vulcanism and deluge, but as a legend it naturally comes to symbolise any such event in which civilisation is lowered and a ‘dark age’ results. But when events in the Mediterranean are considered alongside other facts about the Atlantic coast and its megalithic culture, spread along that ocean’s shores, an inner history starts to be revealed. This secret history, being an internal reality, involves other events that would have an even greater effect than Santorini on the planet; namely the end of the “climatic optimum” that, after the last Ice Age, brought such warm weather to northern climes that a civilisation could prosper up to and even within the arctic circle, and the Arctic Sea was navigable. What a different world that must have been! After the Minoans there arose a religious mythology centred in Greece proper that introduced a twelve-fold set of Olympian gods that were led by Zeus, later titled Jupiter, who had been “born” on Crete and then had deposed his despotic father, Chronos who can be equated with Saturn, the God of Time. I found an artifact in Crete that indicated that the time system of Saturn was in use there after the Santorini event. 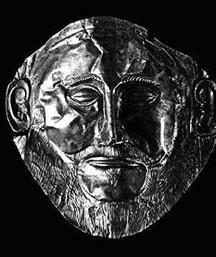 It is therefore most interesting to know how the myth of “Zeus deposed Chronos” came to exist. It appears to have been an oblique description of real events occurring at the end of the Minoan period. The importance of this period cannot be underestimated. The whole concept of the Judeo-Christian god worship arose about this time, which would come to dominate so much of European history. History, as a project, was created by the invention or at least widespread use of writing and written records. The Egyptians had pioneered both history and propaganda on the stone walls of public and non-public spaces, but it was clay, papyrus and paper that would win the day in creating a body of written historical fact. The Minoans represent the modality of Neolithic culture called Matriarchy, in which the leadership, secular and spiritual, appears to come through the female rather than the male. This was soon displaced after the Santorini eruption by the Myceneans and then other groups that invaded from the North - the Dorians, Ionians and so on - and they become essential carriers it seems of a different impulse dominated by men, force of arms and competence at sea. But where did they come from? Thus, around this crucial time, the mythical content of different cultures were meeting and mixing within the Mediterranean basin, which became a womb for the classical, medieval and then, modern worlds to come. These new Greeks appear to have brought with them the 12-fold Zodiac, and established a system of geodetic meaning based around a number of established oracle centres, as described in Sacred Geography of the Ancient Greeks. This 12-fold concept, still in use in astrology and implicit when we say “zodiac”, leads to lines travelling at 30 degree intervals from a centre. This spiritual geography extends into northern Europe in two ways, one being through Italy and France to the southern tip of England, another being directly north to the Baltic Sea, which sea has similar characteristics (to the Mediterranean) in being an inland sea rather than an ocean. The peoples of the Baltic descended to the Black Sea and thence entered via Greece shortly after the Santorini event, with their mythology formed – which is why the Norse and Greek myths are so similar. Other routes for these migrations were through northern Italy and the coastal route around the Iberian Peninsula, i.e. via Spain. These routes were previously trading routes, especially known for amber, bronze (copper and tin), gold and products made with these, the so-called Amber Routes. According to Vinci, Homer’s epic tales are really ancient Baltic sagas of people we would identify as Vikings, Danes, Jutes, Lapps and Fins! Whilst the places were loosely tied to similar topographies encountered in the Mediterranean, the stories are inconsistent in that context but are found to accurately relate to the topography of the Baltic. This might seem far-fetched but is completely congruous with many other known factors about Scandinavian culture. For instance, readers of John Michell’s At the Centre of the World will find that the Polar symbolism discovered in Celtic, Norse and other Ritualised Landscapes is exactly based on having centres with a twelve fold structure. Since the god Zeus is widely associated with Twelve, with equivalents in other parts of the Indo-European diaspora, it becomes a signature of the Indo-European influence as a whole. One of the basic tenets of outer history regarding the Minoans is that they were a great trading empire based upon sea navigation around the coasts. Sea navigation crops up in various interesting places within the outer historical record: The Vikings did it, the Phoenicians replaced the Minoans to found Carthage, the Knights Templar developed a fleet to service their logistical tasks, and the Moors did it (stealing slaves along the Atlantic coast) from the Barbary Coast. In each case there is inner history beneath the surface of these nautical cultures. Vinci says the ships of Homer’s epics have a design like that of the Vikings, including a distinctive removable mast, whilst the Minoan’s are loath to represent their boats almost at all in their otherwise highly visual culture. If the Minoans had trading ships, they might not have had the “business model” of trade or pillage associated with the later Vikings and, not straying into the Atlantic, their nautical skills and equipment might have been inferior. Thus, a superior vessel might have arrived within the Mediterranean. We know that by the period of Ramasses the Great, there were problems on the coast of Egypt from “sea people” of a fierce disposition and wearing helmets with horns. These Northern Sea People merged with the Canaanites to become the loathed Philistines aka Phoenicians. We know also that Crete and Egypt had close trading and cultural links, and Neferatiti, the wife of monotheist Akhenaton, is represented realistically as in the frescos of the palace of Knossos. 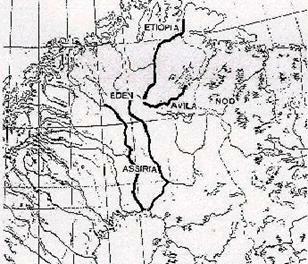 Santorini affected both these empires as it cast a lethal pall over eastern Crete, and also northern Egypt. Tidal wave destroyed many ships and coastal settlements, and the Indo-Europeans arrived into this scenario, colonising large areas of Greece and Turkey. This brings to an end, it appears, a major culture based upon the Neolithic and the role of women that had predominated in the lands surrounding the Mediterranean. Southern Turkey or Anatolia is thought to have been the origin of the Minoans, who seem to have originated from Catal Huyuk. Also fighting against new forces were the Egyptians, with their roots in the Father God and an economy based upon both the fertility of the Nile and the gold that lay in its Nubian headwaters. Between the fertile crescent of Mesopotamia and the Eurasian Steppes ( Central Asia), a mighty Neolithic revolution appeared that clearly influenced the Semitic peoples. This was a true melting pot or even, as John Bennett remarked, the cauldron that somehow fused various cultural influences into a modern composite culture, rather like the metal bronze that was revolutionising the uses of metal through accurate casting of, in particular, weapons. The Indo-Europeans in the Mediterranean would become associated with the iron age that would make still more devastating weapons, but the idea that they emerged in the bronze age, first as Myceneans and then other groups from the north, is thought provoking and may explain the rich culture that emerges from a dark age as Hellenism laid the foundations of “western culture”. It also allows us to look backward and forward from this point to review mysteries such as Atlantis and the Cathedral Building periods. The idea that Atlantis was a culture that somehow centred on the Atlantic coast of Europe is a well-developed one and this leads naturally to the idea that the Megalithic itself was a manifestation of whatever Atlantis was. Either the Megalithic came about after the destruction of Atlantis, or was left behind after that culture had passed away. It is clear that the last minor constructions at the Stonehenge site about 1500 BC are made in the century after Santorini. Before that, megalithic structures stretch out over an ever-increasing period of prehistory, with massive henge structures found over 1000 years before the initiation of the outer ditch and bank of Stonehenge. Putting two and two together, what is the connection between Atlantis and the Baltic culture? The megaliths stretch at least from Portugal in the south to Sweden on the Baltic. If Homer’s epic is relocated according to Vinci’s hypothesis then the Baltic world navigated also the British Isles and even the Faroes. They obtained tin from Cornwall and the Scilly Isles, and were trading through the Thames. It is not conceivable therefore that the Megalithic peoples were different from these sea-farers and therefore the Megalithic culture was (a) Indo-European and, (b) whatever Atlantean means, too. Also, the stories of Homer and the use of tin, existence of smiths, etc, implies that the Bronze Age was under way for these peoples centuries before they had to migrate to the Mediterranean. This is all an embarrassing re-write of history. It means that the short stretch of water from Bronze Age Crete to Greece proper, and its Iron Age Aegean culture, is a large cultural discontinuity. It means that the classical culture was largely grafted on from worsening northern climes. Instead of a story of Atlantean survivors entering the gates of Hercules or of a Mediterranean tin trade bringing tin back from southern Britain: it appears some Baltic (= megalithic = Atlantean = Indo-European) peoples went overland using the Dneiper, to enter the Black Sea with bronze already in their portfolio and weaponry and a great facility with ships that would likely lead on to the later maritime traditions of the Mediterranean sea. The name, Indo-European, derives from the idea that the “Indians” were found to share language roots with Europeans. This culture should really be called Atlantic-European. It is this inner history that has been on hold since the words Aryan Race were polluted by events of the 20 th century. John G Bennett, in his life’s work to interpret the spiritual history of the last ten thousand years, had many adventurous ideas to ponder on, such as Tilak’s books on Aryan roots. His basic intuition was that of four major cultural centres being set up after the descent of a new kind of power into the human, that of the demiurge or maker. The demiurge is an angel for the bringing into existence of the world and its evolving cargo and, through this work, the human experiment with consciousness. His idea was that the different groups were given a different aspect of the whole to focus on and that these, post Stone Age, had produced different ideas about god or the creation. These four streams are encountered in myth and parallel the four cardinal points that define the dynamic of space and time in the year, dividing the Twelve as Four, or can be the four rivers of Eden or the Tetrad of Bennett’s Systematics. A major focus in Bennett’s work is on implicit cosmological ideas that hail from the numerical cosmologies of the past. These imply that the world is the product of an ongoing work of Higher Intelligence. One of the principles of this intelligence is that Understanding itself is a problem because things that might be simple on one level become complex and dense seen on an existential level, that is on Earth. It is only simplicity on such a higher level that could possibly mean that twelve fold structures of meaning, laid out in landscapes by the Atlantic-Europeans might have had any objective meaning. The more one looks at the Gurdjieffian corpus in fact the more one sees the unlikely possibility of an implicit structure for the Universe that is simple. The reason why simple structures could be organising factors is that the higher energies have to do with consciousness and not materiality. Thus the debunking of ancient spiritual modalities by moderns likely comes from their inability to discover higher organising patterns within experience, for it is subjectivity and not objectivity that can intuit patterns within complexity. History is actually full of miraculous transformations and enigmatic movements that, after the fact, cannot be other than the way things happened. The point of “alternative history” is to intuit the “motivation of history” as the manifestations of a higher intelligence. The Atlantic peoples came into contact with the Goddess culture and subsequently dominated an “old world” of Egypt and the eastern Mediterranean. Akhenaton’s obsession with the Sun and Moses’ flight out of Egypt, and into monotheism of a greater kind, may have been connected. The same can be said of Santorini: Did it help to steer the Jews into Sinai as Graham Philips suggests in Act of God? There can be no doubt that the old world was dealt a severe blow by Santorini and this appears to have been followed by an invasion from the North. Can these things be a co-incidence? We should remember that the city of Jerusalem, at least as we know it, did not yet exist. Only Canaan and the cities that were to be destroyed by the army of Joshua were there. But Jerusalem lies on a line passing through Delphi, Athens, Delos (birthplace of Apollo, the sun god). That is, it is on one of those 12-fold lines that belong to the geodetic ideas of the Atlantics down from the North, a line that travels through Italy and France to reach southern England. This Apollo line meets another 30 degree line in southern England which has come to be called the Michael line because churches called after St Michael and also St Mary, are found on natural fastnesses that fall, within the landscape, along a line. 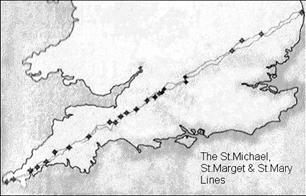 The Michael line is the longest line in southern Britain. The name Norman means ‘Man from the North’ and the reason for it is that they came from the north when they first attacked France, from Denmark. There is a lot of misunderstanding about Vikings, especially between Norway and Denmark – however, Denmark is very significantly as the entry to the Baltic Sea. Also the Michael line, after leaving eastern England, passes through Denmark and into Sweden. When the Normans attacked Paris, up the Seine, they were a very real threat that was eventually contained through a deal where the Normans consolidated their lands in Normandy in exchange for integration with the French state as vassals of the King, officially Christians. For one or two generations they still spoke Danish. 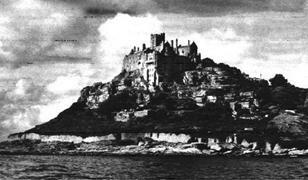 The Apollo line has a very significant island on the coast now called Mont St Michel. 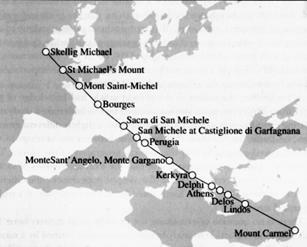 After its establishment years before, the Duke of Normandy had thrown out the current monks and invited the Benedictine Order to re-establish the abbey (Some free-booting Normans had encountered the Benedictines on the eastern coast of Italy, where they ran a major Michael shrine on the Italian peninsular at Mount Gargan). Something strange was about to happen. These Normans aided the Pope and conquered much of southern Italy and Sicily, which gave them influence with the Church. Soon after, the First Crusade was declared. The Benedictines and their predecessors acted through the post-classical dark ages to preserve knowledge in the monasteries – fortified retreats that could collect and reproduce documents during a period when they could so easily be destroyed. As they emerged into the Middle Ages they appear to have had secret knowledge about the network of pagan sites that were redefined as sacred during the medieval age. Some of these sites are on the lines lying within the 12-fold patterns emanating and linking important sacred sites throughout the ancient world. Thus the medieval cathedrals would be built directly over ancient sites, as is also found with the Michael line that has churches on its peaks. The two greatest Christian establishments of England lie on the Michael line: Glastonbury and Bury St Edmunds. As soon as William is established, he has problems in the North with one of the strongest Earls, Northumberland. This led to devastation from Yorkshire up to Durham and the establishment of a unique combined Princedom and Bishopric there, the building of a grand cathedral and installation of the Benedictines. A line at right angles to the Michael line, departing from Bury St Edmunds, will locate Durham, which is also to be found directly north of Mont St Michel. The problem with the Normans is that their relationship to the Benedictines appears to have been a partnership with knowledge about the importance of ancient places, a type of knowledge that exactly corresponds with what must have existed in Megalithic times and was inherited by the pagan Celts and others who were sympathetic to the meaning of the landscapes in which they lived yet whose cultures they suppressed. In our context of men from the north derived from a sea-faring megalithic age, we are faced with a possibility that history may not be just “one damn thing after another” but might be guided by knowledge if not an Intelligence that always lies in the background as a question mark. It seems too cosy that these things happen with the ‘usual suspects’ of northmen, Benedictines and the whole thing gets a lot messier by the time the cathedrals get built on top of what is a Megalithic network of sacred sites. 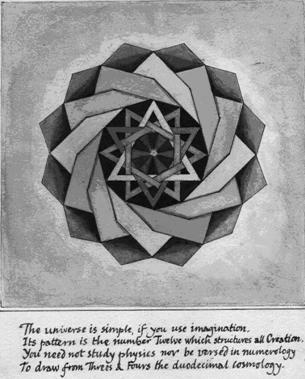 The ancient oracle centres were organised upon the earth with a major geometry being the 12-fold, 30 o geometrication. This creation of patterns of meaning is found wherever the Atlantic-Europeans have spread their cultural norms. Add to this the Ancient Model of the Earth, the widespread dispersion of weights and measures and the numerical model of harmony based upon Twelve and it is hard not to see that there is a single phenomenon at work. Whoever developed and understood these systems were inheritors of a very high civilisation. However, the idea of "energies" aligned with points on the Earth, i.e. sacred places, is deeply “pagan”, and had been made taboo by the society within which the Benedictines and Cistercians were still practicing them. Their re-use of the ancient sites, and the inner history that unwinds along the Apollo and Michael lines, bridges many apparent discontinuities in the prehistory and history of Europe.